The Hayman DD-105 grows with your child! The Hayman DD-105 is ideal for the novice and intermediate drummer from the age 5 and up. The height adjustable frame allows the DD-105 to "grow" with your child, simply unfold the arms and use the quick release fittings to set the height to the required size, and re adjust as your child grows! The DD-105 is also an excellent choice for drummers who want to develop their talents without clogging up their homes, its compact size makes it easy to setup in a corner of a room and when folded, it's easy to put away, even under a bed! All of the above makes the DD-105 the perfect choice for drummers who want to play at home, without causing a fuss!. The DD-105 comes with an easy to operate sound module. You can also play along with your favourite artists, just connect your Mp3 player or iPod and start making music with your idols! Coach Mode is a unique set of tempo, timing and endurance exercises , specially developed to help drummers to learn or improve upon their skills. 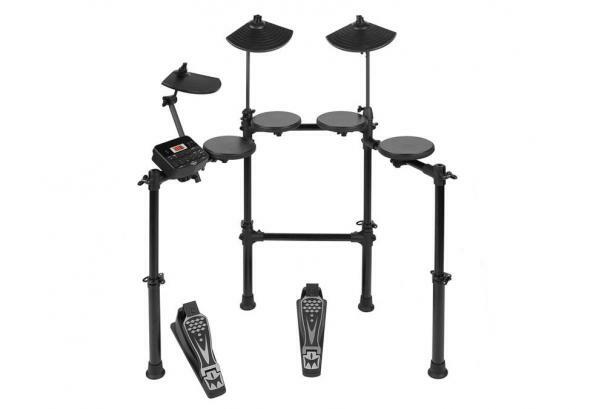 Drumsticks, power supply, drum key, manual and setup guide are included along with the pre-assembled, height adjustable frame, perfect for quick and easy set up.